I have been playing Meta Model tic tac toe with Peter Midgley for seven years and it never gets old. Well, for us at any rate although we have worn out several white boards and the patience of many a colleague along the way. As a pair of avid enthusiasts we have found that iron sharpens iron. Only now the potential significance of our meta findings calls for many more specialists in every field of enquiry to test the model’s truth and utility. All along we have dared to be naive and so I ask that you please put aside any contempt prior to investigation you may have and read this unfolding of the Meta Model through to the end. However if you find yourself time poor, feel free to skip to the remaining section below the rotating Tesseract (Hypercube). If we are right then the Meta Model may serve as a public good in every single area of human endeavour. For it can provide us with a means to predict progression within any process, at any level of abstraction; revealing many key openings as well as obstructions to our advancement. By definition, a Meta Model for our Universe both within and without would only be worthy of the name if it explained all past, present and future phenomenon, both known and unknown. We acknowledge that such a meta understanding of reality may at first be daunting or even overwhelming and so we shall attempt to demonstrate this tremendous utility by building facet upon facet. We have many macro examples to share with the world but if we are to convey the significance of the Meta Model as a whole we have chosen to demonstrate its utility by providing the key insights that may help resolve the Theory of Everything (ToE); a single, all-encompassing and coherent theoretical framework of physics that fully explains and links together all physical aspects of the Universe. To date, two theoretical frameworks have emerged that most closely resemble a ToE: General Relativity (GR) and Quantum Field Theory (QFT). With the aid of the Meta Model we shall describe how both of these theoretical frameworks may be integrated into a cohesive whole, by bringing new insight into one of the great unsolved challenges of scientific history, while revealing an even deeper underlying reality, but more on that later…. It all started out as a single line of enquiry as we attempted to understand the basis for our own culture at Present Group. At the time, we had also been inspired by the human genome project that had succeeded in mapping the more physical attributes of our biological genome. It’s goal had been to determine the sequence of chemical base pairs which make up human DNA, and of identifying and mapping all of the genes of the human genome from both a physical and functional standpoint. It occurred to us that we might also map our identity, values, beliefs and capability as a metaphysical memome. A meme acts as a unit for carrying cultural ideas, symbols, or practices. We really wanted to know what made us tick as a collective and so we figured that a memome would be the memetic sum of the organisation as whole. The fourth order effect appeared to summate and transcend the other three. The base pair findings especially caught our attention as they were reminiscent of the human genome: DNA usually exists as a double-stranded structure, with both strands coiled together to form the characteristic double-helix. Each single strand of DNA is a chain of four types of nucleotides. Nucleotides in DNA contain a deoxyribose sugar, a phosphate, and a nucleobase. The four types of nucleotide correspond to the four nucleobases adenine, cytosine, guanine, and thymine, commonly abbreviated as A,C, G and T. Adenine and guanine are purine bases, while cytosine and thymine are pyrimidines bases. 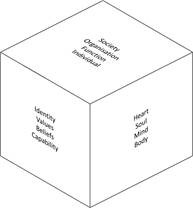 Here is a base rendition of our initial memonic culture cube where the x,y,z dimensions intersect ‘AS’ the fourth order effect. There are 64 intersections for a three dimensional representation with four strata per dimension. We now had a means to characterise our organisation and the context within which it was set. It also gave eight degrees of alignment to consider for each of the intersections (0,-x,+x,-y,+y,-z,+z,¥). 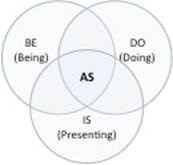 We finally distilled the most abstract terms down to Be, Do, Is and As. We also found it useful to assign the meta tags of body, mind, soul and heart to our findings from the first through to the fourth order effect respectively. Over time by repeated example our instinct, and intuition drew the conclusion that the essence of each order of effect resembled these tags. It gave us a common language. For example we might ask ourselves what is the body of understanding…. Information. What is the mind of understanding…. Knowledge. What is the soul of understanding…. Wisdom and so on. They are also useful to keep track as you move up and down levels of abstraction and layers of interaction. Next came a eureka moment when we realised that the underlying answer to this pattern lay in the basics of geometry. The Tetrahedron. Therefore we must first pay homage to Plato and his theory of ‘Forms’ which asserts that it is the non-material abstract forms and not the experiential material world of constant change that signifies the highest and most fundamental kind of reality. This is the basis for the Meta Model as it applies the same meta pattern to every transient phenomenon of reality, so revealing it’s actuality. The Platonic solids have been known since antiquity and while they are prominent in the philosophy of Plato. Some credit Pythagoras with their discovery. Other evidence suggests that he may have only been familiar with the tetrahedron, cube, and dodecahedron and that the discovery of the octahedron and icosahedron belong to Theaetetus, a contemporary of Plato. In any case, Theaetetus gave the first mathematical description of all five and may have been responsible for the first known proof that no other convex regular polyhedra exist. Plato also wrote about them in the dialogue Timaeus c.360 B.C. in which he associated each with one of the four classical elements (earth/cube or hexahedron, air/octahedron, water/icosahedron, and fire/tetrahedron) As for the fifth Platonic solid, the dodecahedron, Plato obscurely remarked; “….god used for arranging the constellations on the whole heaven”. Aristotle later added a fifth element, (ether) and postulated that the heavens were made of this element, but he did not directly assign it with Plato’s fifth solid. The dodecahedron and the icosahedron form a dual pair. This presents us with the first key understandings toward the basis of the Meta Model. The tetrahedron as a self-dual can be reassessed so as to encompass the actuality of there being six Platonic solids. 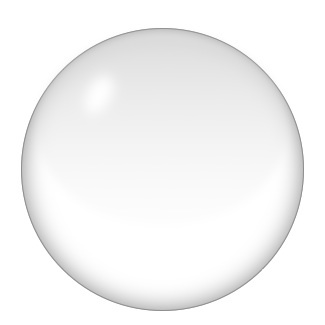 Admittedly it’s dual may look the same as the original but it has fundamentally changed states by inverting its four faces and four vertices. 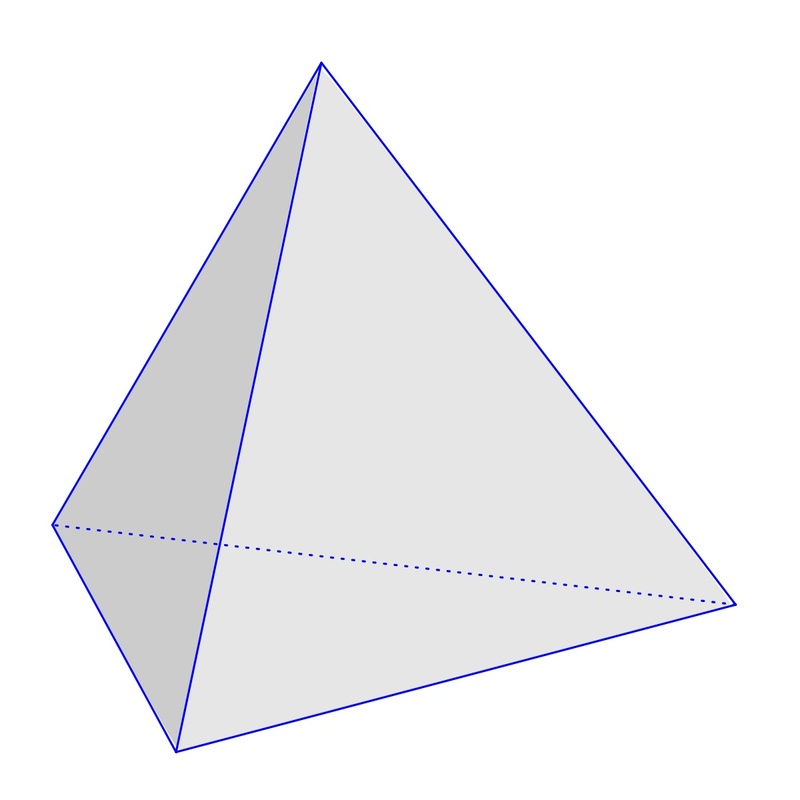 Other than being the only Platonic solid to be self dual, the tetrahedron is special for a number of other reasons; it is the simplest of all the ordinary convex polyhedra and the only one that has four faces, it also has the smallest volume for its surface area. Yet it is the tetrahedron’s status as a self dual that is the primary basis for the Meta Model, as this initial insight gave rise to an important thought experiment. We asked ourselves; If the tetrahedron were the geometric building block for all configurations of reality both physical and metaphysical then could it reveal all variants of manifestation? Our first visualisations shown above were of the tetrahedron in free floating isolation, the first state in the upper left quadrant could be considered it’s origin. We termed this point of origin as ‘Revert’. When you revert to the beginning, you ‘turn’ back to it, so this would always serve as the start for any process. The second visualised state whereby it looked alike but was fundamentally different was to turn it into its dual. We termed this second manifestation as ‘Invert’ and the process from revert to invert as ‘Reflex’: a thing which is determined by and reproduces the essential features or qualities of something else. A third state could be visualised when we turned it on its axis. We termed this third manifestation by external rotation as ‘Exvert’. We also termed the process from revert to exvert as ‘Reflect’: to give evidence of the similar external characteristics of something. Finally, a fourth fundamental state could only be realised if we combined both the reflex and the reflect processes. We termed this fourth manifestation as ‘Covert’ to signify the combination of both of these prior processes. 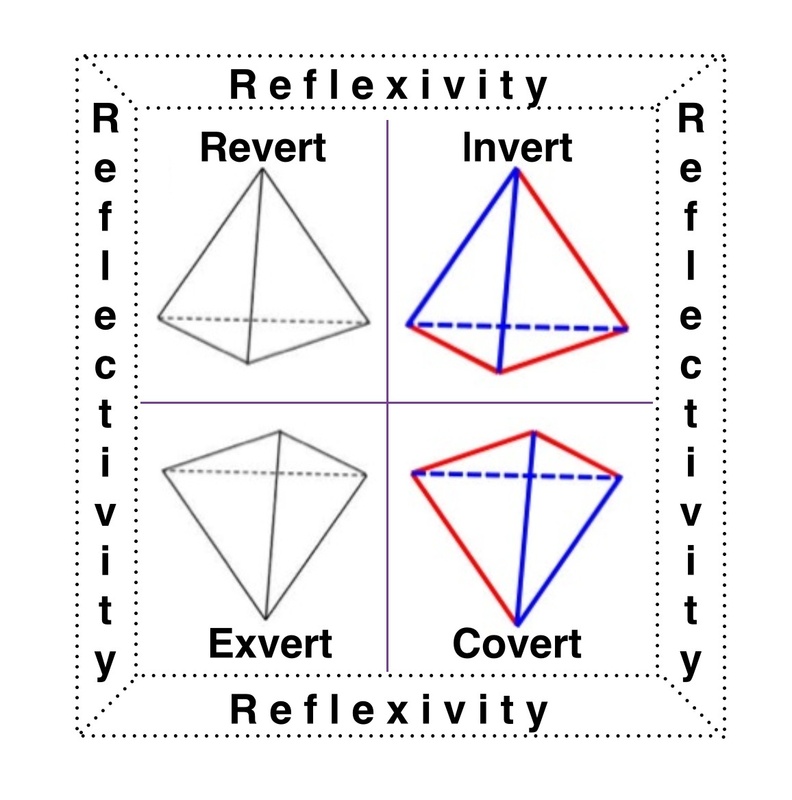 To summarise: the Meta Model can loosely be described as the reflexive and reflective interrelationships between the manifestations of revert, invert, exvert and covert tetrahedral configurations. As shown above, the four elementary arithmetic operators (addition, multiplication, subtraction, division) that we most commonly use with real numbers can be assigned to each quadrant. So too can the four real and imaginary notations most commonly used with complex numbers. 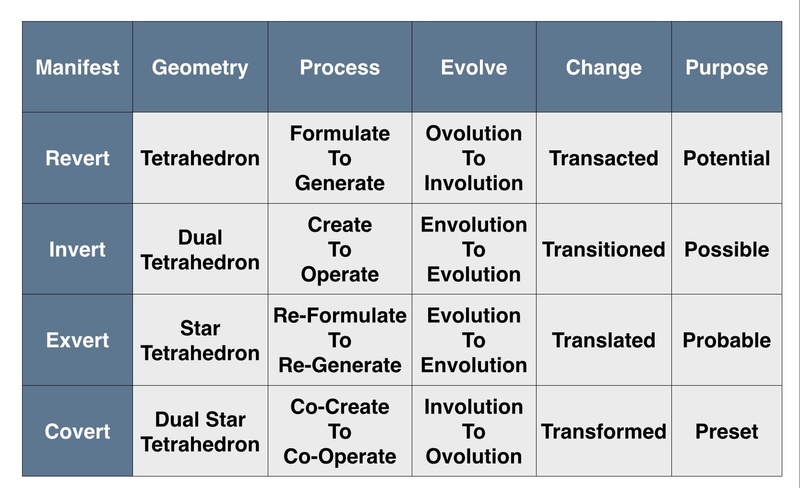 Hopefully this will provide some basic insight as to the interaction and interdependence of the four tetrahedral quadrants. 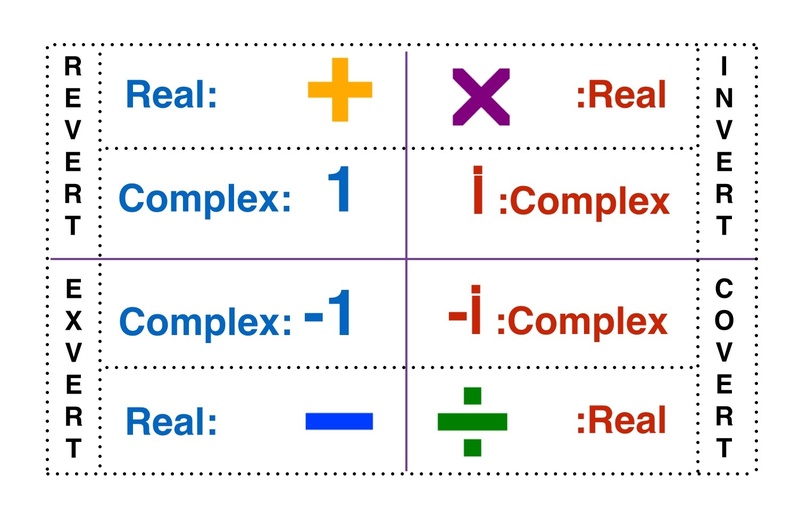 The four elementary arithmetic operators used with real numbers and the four notations found with complex numbers are also useful to understand the basic interrelationships between quadrants. Holistic (heart): primarily conductive reasoning (values). O octonions, dimension 8, not associative or commutative. We believe that this 1,2,4,8 principle of progression is also at the heart of understanding a ‘Theory of Everything’ (ToE) for the Physical Universe and points toward four dimensional geometry. The three dimensional Star Tetrahedron (Merkaba) represents the notion of reflectivity between the quadrants while the four dimensional Hypercube (Tesseract) represents the combined properties of reflectivity and reflexivity. Time and again over the many years of meta modelling we have found ourselves pondering the nature of the tesseract. For example if we were to reflex a dual star-tetrahedron then we can begin to imagine the 16 vertices and 32 vectors of the tesseract progressing in four dimensions. We have taken the liberty of assigning eight physical properties to our Meta Model Universe as we have come to understand their complimentary nature coupled with their descent from freedom to determinism and back again. In this case, we are using the terms of dimension, direction, detection and densation as placeholders to describe each of the four tetrahedral manifestations. We first assigned revert with our one temporal dimension (t) as the fourth order effect of our three spatial dimensions (x,y,z). Then we reflexed this tetrahedral arrangement to its self dual and assigned it the properties of three momentum (px,py,pz) with a fourth order effect of energy (e). In simplistic terms: Space-time may be perceived to provide the “container” for our reality while Momentum-energy is more indicative of the ‘contents’ that inhabit the Space-time framework. The reflexive nature of this is quite apparent as Space-time is in effect turned ‘inside out’ to create dual properties of Momentum-Energy. Now with the properties of dimension (revert) and direction (invert) we reflected and attributed the three unified forces (strong, weak, electromagnetic) and the fourth order effect of field to detection (exvert). Finally we both reflexed and reflected this to realise the three properties of matter (volume, density, mass) and the fourth order effect of gravity to densation (covert). Again in simplistic terms: Force-field may be seen to provide the ‘tent poles’ for our type of reality while Matter-gravity provides it’s reflexed dual as the material ‘tent’ itself. the sum of all space would equate to all the time our universe has…. the sum of all momentum would equate to all the energy our universe has…. 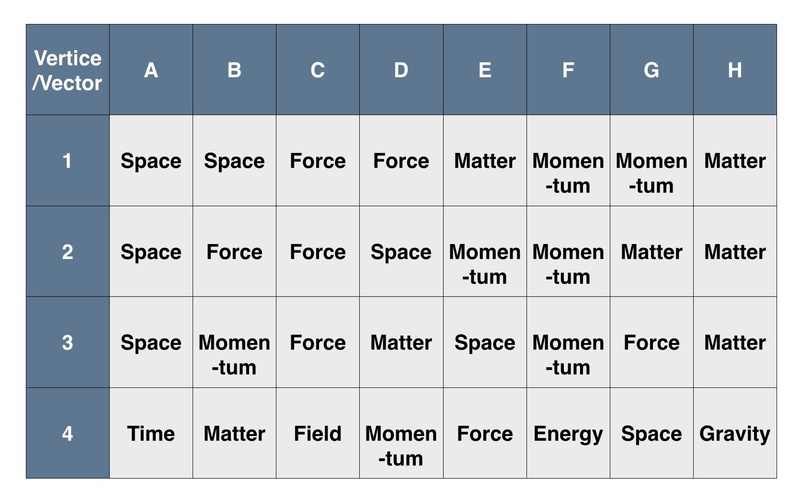 the sum of all force would equate to all the field our universe has…. the sum of all matter would equate to all the gravity our universe has…. space without gravity but not space without time…. gravity without space but not gravity without matter…. energy without field but not energy without momentum…. field without momentum but not field without force…. 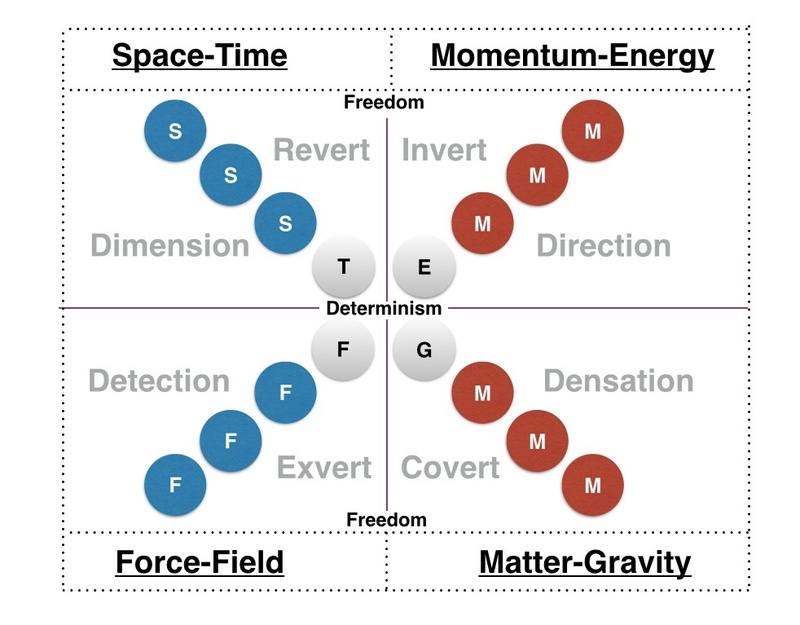 Another correlation is found when we consider the dual aspects of freedom and determinism having the greatest emphasis on the respective first and fourth order effects in any given quadrant. 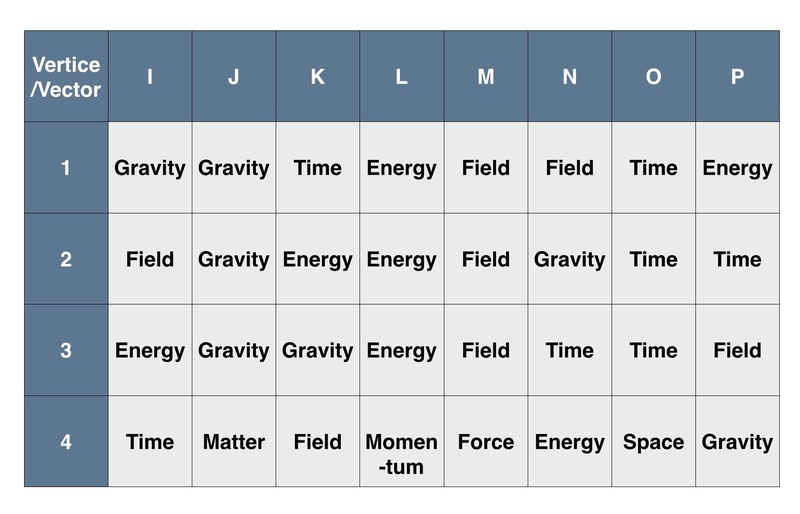 Essentially the first order effects of space, momentum, force and matter are markedly freer than the fourth order effects of time, energy, field and gravity. The first key observation from all this is that gravity in the covert is estranged from the three forces in the exvert. As one another’s dual this fundamentally places gravity in a whole other paradigm from that of force. Existing in the densation quadrant; gravity is not so much a force, as it is a “feel”. Gravity can only pull while the other forces in nature have opposites. In the case of the electromagnetic force, for example, it can attract or repel, depending on the charges of the bodies involved. So what makes gravity different? Again the geometrical progression of our universe may be understood as a spacial singularity; which in process terms could be seen to start as a ‘push’ as the first order effect in revert. It would then reflex as a push-pull in the invert and reflect to pull-push in the exvert before resulting in a pull toward gravitational singularity as the forth order effect of the covert. Also, since Matter-gravity is the reflexive dual of Force-field it may be reasoned that gravity in terms of General Relativity cannot be unified with the forces of Quantum Field Theory until this dual nature is mathematically transposed. Quite simple, Matter-gravity must first be reflexed to Force-Field or visa versa. John Baez once described the Mathematical nature of Octonion’s as the “crazy old uncle nobody lets out of the attic”. The Meta Model suggests that gravity with its covert nature may well be a similar contender within Physics and may also explain why so far it has not joined the family, so to speak. A clue may be found in the attribution of non-locality and non-unitarity to gravity just as octonions were found to be non-associative and non-communicative. Like most things in life, if we are to truly understand our own Universe then the next higher level of abstraction often provides a better vantage point. In the case of our own Universe this would be to model it’s configuration of eight universal physical properties within the greater four dimensional realm of the tesseract. In geometry, the tesseract, 8-cell or regular octachoron or cubic prism, is the four-dimensional analog of the cube; the tesseract is to the cube as the cube is to the square. Just as the surface of the cube consists of 6 square faces, the hypersurface of the tesseract consists of 8 cubical cells. The tesseract is the four-dimensional hypercube, or 4-cube. The word tesseract was coined and first used in 1888 by Charles Howard Hinton in his book A New Era of Thought, from the Greek (“four rays”), referring to the four lines from each vertex to other vertices. As above, the tesseract can be unfolded into eight cubes into three dimensional space, just as the cube can be unfolded into six squares into two dimensional space. An unfolding of a polytope is called a net. There are 261 distinct nets of the tesseract. 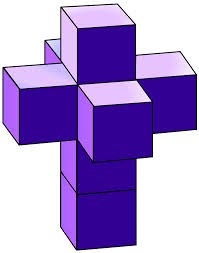 All in all, it consists of 8 cubes, 16 vertices, 24 squares, 32 edges. 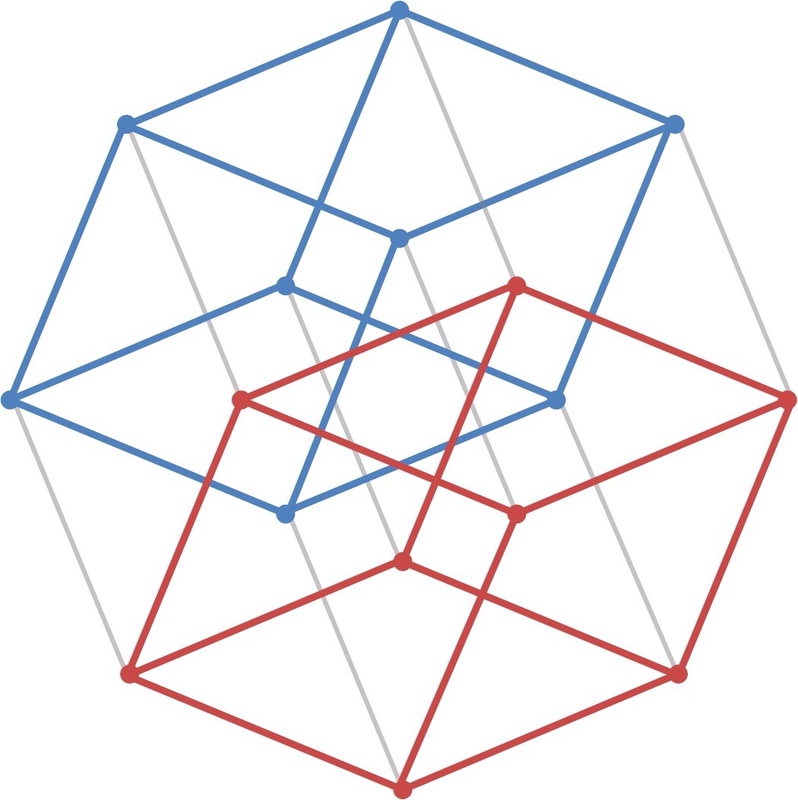 This two dimensional view of the Tesseract has been highlighted to show the dual relationship between two of the eight cubes present. The cubes are a bit distorted by rendering them into two dimensions but you can count all eight cubes if you care to select any two of the outside vertices to locate the base of a square and then project it’s cube as you rotate either clockwise or anticlockwise. In this way, you should be able to visualise all eight cubical cells without too much trouble. The two parallel cubes highlighted in blue and red will also serve to pick out two dual Universe’s. In the Matrix movie, the main character Neo is offered the choice between a red pill and a blue pill. The blue pill would allow him to remain in the fabricated reality of the Matrix, therefore living the “illusion of ignorance”, while the red pill would lead to his escape from the Matrix and into the real world, therefore living the “truth of reality”. Therefore let us use the Matrix analogy to describe the blue cube as our own universe and the red cube as our imaginary dual universe. The eight vertices of our blue universe are marked ABCDEFGH while the eight vertices of our dual universe are marked IJKLMNOP. Also, as befits four dimensional geometry, all vertices are the intersection of four vectors (“four rays” x,y,z,w). 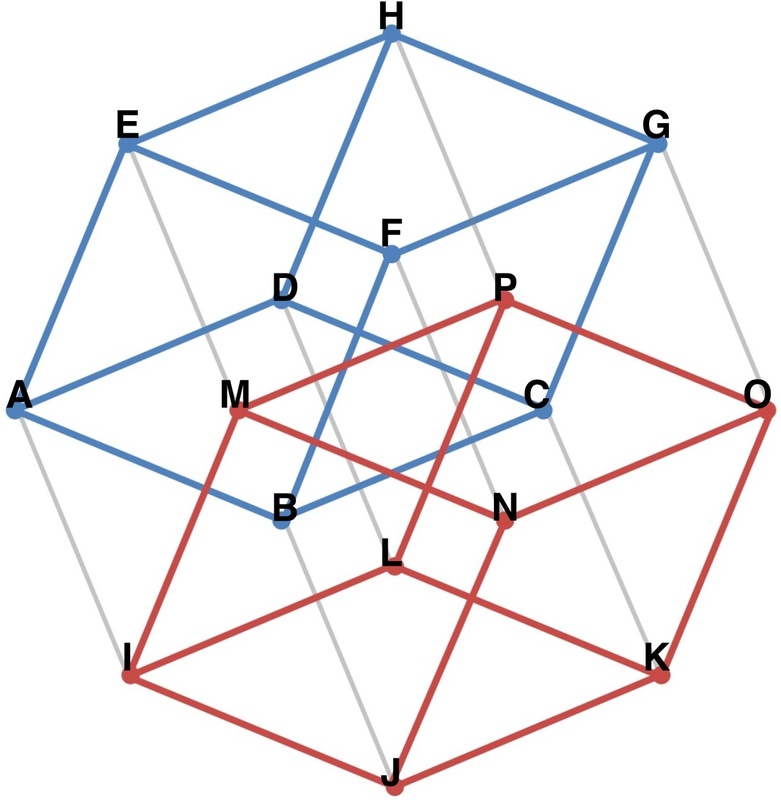 Therefore the eight single grey vectors ‘w’connecting the dual blue and red universes are representative of one unique universal property as a fourth order effect. The four real sets (ACFH) demonstrate our familiar three into one’s. Whereas the four imaginary sets (BDEG) are a mixed bag and therefore to our minds weird and wonderful combinations to behold. Temptingly the two alien fourth order effects of ‘matter’ found in column B above and column J below may very well describe the respective phenomenon of dark matter and anti matter. The reflexive axis is also clearly apparent between columns D and E above and columns L and M below. We can now have some real and imaginary fun exploring our dual Universe with its strange and exotic inventory. Its four real sets are inversions of our familiar reality and therefore we have four intriguing new sets and fourth order effects to consider. Synchronicities would be as common as symmetries are for us. Our universe’s third order effects of space, momentum, force and matter appear very real to us while our fourth order effects of time, energy, field and gravity appear more surreal. No doubt our dual doings, as we are beings would find space, momentum, force and matter equally surreal. In summary we may deduce that there are eight unique Universes in the Multiverse. The other six can be mapped in the same manner as we arrived at our dual. Each universe’s progression is a variation of the same eight universal properties manifesting as a set of four real and four imaginary revert, invert, exvert and covert beginnings and endings. 8 An octo of Universes (two quads with invert & exvert properties interchanged). Again the limits of four dimensional geometry set a ceiling on the number of cubes in a tesseract and hence the number of universes in a multiverse as it would break a fundamental law of geometry to directly reflex between revert and covert manifestations. This begs the question whether all, some or none of these alternate universes are viable? Well first of all we may have to ignore our parochial notions that arise from our own local experience of reality when considering what may constitute viability in an alternate universe. As with meta modelling in general this may have to come with a health warning as it is likely to induce either altitude sickness or non-motion sickness. One last thing to ponder. The tesseract is beautiful in its own way, however this type of four dimensional geometry appears awkward and so we might not describe it as elegant. Let us consider a square with two dimensional spin (x,y). Now consider a cube with three dimensional spin (x,y,z). Then consider a tesseract with four dimensional spin (x,y,z,w). We arrive at a Torus (Hypersphere), now that could be described as both beautiful and elegant, but unlike the tesseract as it’s own cluster of 8 universes (realities) it looks a tad lonely. As a matter of interest the International Mathematical Union (IMU) adopted a new logo, on the 22 August 2006 at the opening ceremony of the International Congress of Mathematicians (ICM 2006) in Madrid. It was the winner of an international competition announced by the IMU in 2004. The logo was designed by John Sullivan, Professor of Mathematical Visualization at the Technical University of Berlin (TU Berlin) and at the DFG Research Center MATHEON, and adjunct professor at the University of Illinois, Urbana (UIUC), with help from Prof. Nancy Wrinkle of Northeastern Illinois University. 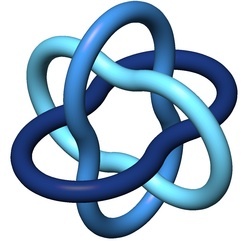 The winning logo design above was based on the Borromean rings, a famous topological link of three components. 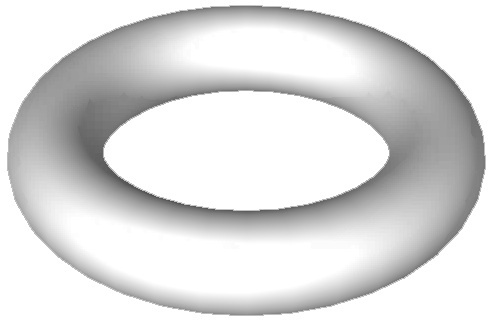 The rings have the surprising property that if any one component is removed, the other two can fall apart (while all three together remain linked). This so-called Brunnian property has led the rings to be used over many centuries in many cultures as a symbol of interconnectedness, or of strength in unity. Although the Borromean rings are most often drawn as if made from three round circles, such a construction is mathematically impossible. The IMU logo instead uses the tight shape of the Borromean rings, as would be obtained by tying them in rope pulled as tight as possible. 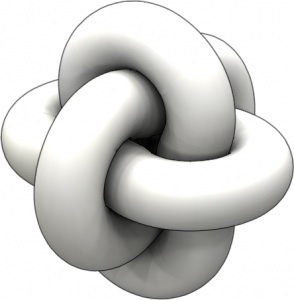 Mathematically, this is the length-minimizing configuration of the link subject to the constraint that unit-diameter tubes around the three components stay disjoint. This problem and its solution are described in the paper Criticality for the Gehring Link Problem by J.Cantarella, J.Fu, R.Kusner, J.Sullivan, N.Wrinkle, Geometry and Topology 10 (2006). Let’s leave it at that for now. We have taken you through the leanest journey to get to the highest level of abstraction. More will no doubt be revealed…. We have decided to go public with the Meta Model by proposing a description of the Universe, the Multiverse and beyond as a method to attract the keenest minds to develop our understanding further for the benefit of mankind. We surmise that if it can stand up to the rigorous scrutiny of Mathematicians and Physicists then it will no doubt hasten its more general acceptance and adoption within the wider community. The most difficult part of writing this public introduction to the Meta Model was deciding what to leave out. Amongst other things we are developing ‘Artificial Intuition’ decision engines informed by the Meta Model that go beyond the algorithm. We have automated knowledge with the deductive power of the algorithm but if we are to survive and flourish despite ourselves then we need to also automate wisdom with the abductive power of the “Meta-sphere”. We cordially invite you to explore the nature of actuality with us. ← A Data Trust-Sphere Analogous To A Life Biosphere : Or How Three Into One Will Go?